Suomi NPP VIIRS smoke aerosol index (light pink to magenta color) shows the smoke plume transport from fires in the western US for 8/30/2015. Fire hot spots are shown as red dots with dot size indicating the magnitude of the FRP. The IDEA website that currently provides aerosol products from different NOAA and NASA satellites is being enhanced to provide a VIIRS blended fire and smoke product to the user community. This enhanced IDEA system is being designed to incorporate the new VIIRS FRP product which is transitioning into NOAA operations. Near real time information of FRP, which characterizes the intensity of the fire, and smoke plume areal extent as provided by the IDEA system, are useful for allocating resources by the NWS in fighting fires and providing warnings for poor air quality. The figure below shows VIIRS RGB image for August 30, 2015 with fire hot spots / FRP and smoke plume overlaid. The fires in northwest US were intense and burned continuously in August 2015. 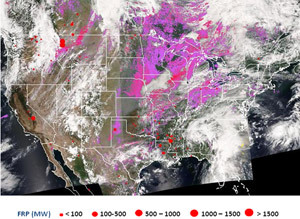 Smoke (pink to magenta color) originating from these fires moved and spread across the eastern part of the US and impacted air quality in some downwind regions. Total column ozone from TOAST - 10/2/2015. Atmospheric ozone product estimates from measurements of the Suomi NPP OMPS andCrIS the MetOo-A and -B GOME-2; and the NOAA- 19 SBUV/2 are being used to monitor the behavior and evolution of this year's Antarctic Ozone Hole. The figure below uses the OMPS Limb Profiler ozone profile estimates along an orbit for the curtain plot and a daily map or Total Ozone from Analysis of Stratospheric and Tropospheric components (TOAST) using S-NPP CrIS for the troposphere and NOAA-19 SBUV/2 for the stratosphere. 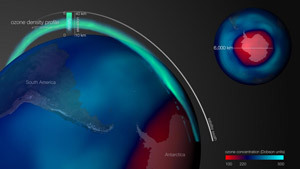 This year's Ozone Hole has been particularly large and deep reflecting the large and stable Antarctic Polar Vortex. 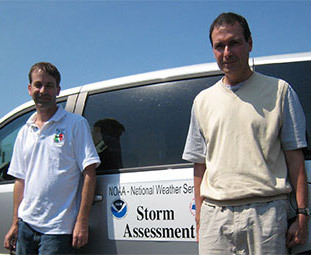 A NASA web page that profiles users of NASA data, features a GOES-R research project led by K. Gallo (STAR), P. Schumacher (NWS-Sioux Falls), and J. Boustead (NWS-Omaha): The profile highlights an ongoing project partially funded by the GOES-R program that includes validation of radar products that estimate hail signatures as well as hail size and spatial extent of hail swaths; compare simulated GOES-R ABI products to the field surveys, Landsat, and Suomi NPP VIIRS data to evaluate the GOES- R ABI data for assessment of the areal extent and severity of hail damage; and to develop potential GOES-R ABI hail event validation and assessment products. In early December 2015, Beijing and other cities in China came to a standstill due to intense smog generated from urban/industrial pollution. Most local newspapers have started dubbing these smog events as "Airmageddon". 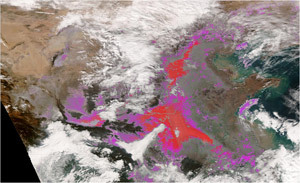 The true color image of VIIRS and the Enterprise aerosol detection algorithm have captured the smog as shown in the image below for December 6, 2015. The aerosol detection algorithm designed to detect either smoke or dust has picked up regions of smog as smoke that originates from fires. Smoke aerosol from fires is absorbing and the algorithm uses various spectral differencing tests in the visible, infrared, and deep blue wavelengths to detect smoke. Detecting urban aerosol as smoke is not expected because urban smog tends to be predominantly scattering rather than absorbing. However, in China, coal burning in low-tech furnaces reportedly emits brown carbon that is very absorbing and is being observed as "smoke" in VIIRS aerosol detection algorithm. Instead of reporting this as a "data artifact", the Enterprise aerosol detection algorithm output will be qualified to indicate that it detects dust, smoke, and absorbing black/brown carbon. A representative image from the new Global Mosaic of Geostationary Satellite Imagery product, which combines images from GOES-E, GOES-W, METEOSAT, and MTSAT. 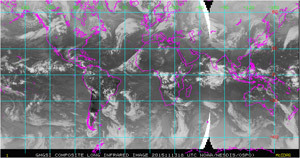 A recently developed suite of global geostationary satellite image mosaics has been implemented in OSPO. New software merges visible, thermal infrared, and shortwave infrared imagery from GOES-13 and 15, MSG SEVIRI, and MTSAT into a global composite image. The global mosaic images are generated at high resolution, 8 km, and extend coverage to the polar circles (67� latitude) to satisfy a request from EMC. The global image mosaic software passed the code review in June, 2015 and the product passed the operational readiness review in October, 2015. The decision brief for the Global Mosaic of Geostationary Satellite Imagery (GMGSI) product was held at the Satellite Products and Services Review Board (SPSRB) meeting on Wednesday, October 21, 2015. The SPSRB approved operational implementation of the GMGSI product and the new products will be disseminated from OSPO to broader user communities. November 4th - 6th, 2015 - SMCD members Changyong Cao, Kevin Gallo, and Bob Kuligowski participated in a briefing on relevant NOAA Committee on Earth Observation Satellites (CEOS) activities in advance of the CEOS Plenary meeting in Kyoto, Japan. The briefing was to provide NOAA Assistant Administrator for Satellite and Information Services, Dr. Stephen Volz, updates on NESDIS activities within the various CEOS Working Groups and Virtual Constellations. What internal measurements do you make to maintain your instrument's calibration in orbit? What internal consistency methods do you use to check the calibration? 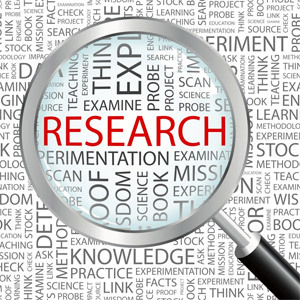 What measurement characterizations are most important? What external methods and measurements do you use to maintain your instrument's calibration in orbit? What external resources, if any, are regarded as reference measurements? Does your sensor use vicarious calibration methods? A poster titled "Using NDVI Satellite Data to Identify and Document Destructive Hail Swaths" co-authored by Kevin Gallo was presented at the annual meeting of the National Weather Association by Josh Boustead (NOAA- National Weather Service). 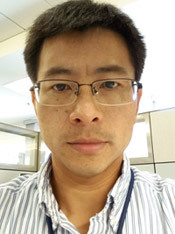 Dr. Yong Chen - a CICS/UMD Research Scientist working in NOAA/STAR/SMCD, was given the best proceeding paper award for his paper titled as "CrIS Full Resolution Processing and Validation System for JPSS" authored by Yong Chen, Yong Han, Denis Tremblay, Likun Wang, Xin Jin, and Fuzhong Weng during the 20th International TOVS Study Conferences, which was held at Lake Geneva, Wisconsin from October 28 to November 3, 2015. 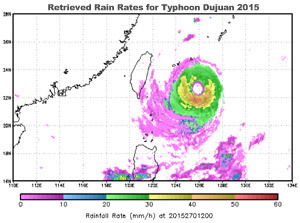 Dr. Chen's paper is focused on the Cross-track Infrared Sounder (CrIS) - a key instrument onboard on Suomi NPP and future JPSS satellites, which provides the atmospheric sounding information for numerical weather prediction models. Dr. Chen has made significant contribution to develop the NOAA's first-ever full spectral resolution CrIS data precessing system. The high-quality shown in his paper, perhaps most importantly, the innovativeness and accomplishments from the newly-devlopved system are fully reconized by international community. November 4-5, 2015 - Tony Reale (STAR) and Bomin Sun (IMSG) attended the 5th GEWEX G-VAP working group meeting from November 5-6 held at the Lowell Center, SSEC, University of Wisconsin, Madison. The major goals of G-VAP are to quantify the current state of the art in water vapour products being constructed for climate applications, and support the selection process of suitable water vapour products for the production of globally consistent water cycle products. The workshop was attended by over 25 international participants with presentations spanning the landscape of global water vapour observations from satellite and ground based sensors and their application in global weather and climate modelling applications. Evident was the overall high correlation of the respective water vapour time series from the various platforms including against athe variety of global climate indices, such as El Ni�o, and greenhouse gases. Surprisingly, such correlations were not reflected in many of the climate re-analysis models supposedly assimilating such observations, for example MERRA (NASA), CFSR (NOAA) and ERA-40 (ECMWF), a potentially disturbing "disconnection" within the G-VAP WG. A. Reale provided a presentation entitled "Quality of instantaneous water vapor profiles assessed with NPROVS+". An excerpt from this presentation citing the importance not only of carefully collocating the satellite and ground based observations, but in also selecting the proper statistical metrics for comparing performance is shown in the panel below. The G-VAP WG seeks to leverage the STAR NPROVS+ to help ascertain suitable candidate water vapour products among the various satellite sensors, derived products and ground based measurements. Mr Reale has agreed to co-lead Section 5, Analysis of instantaneous data, of the planned WMO World Climate Research Program G-VAP Report scheduled for completion in mid- 2016. This includes appending water vapour profile products derived from HIRS (Shi, NCDC) onboard recent MetOp-A and -B satellites into NPROVS+ for consideration in the selection process. The 6th Asia/Oceania Meteorological Satellites User's Conference was held on November 9-12, 2015, Tokyo, Japan and was attended by 140 people from Asian-Oceania countries. Fuzhong Weng gave a presentation on building high quality SDR products from NOAA operational satellites for weather and climate applications. He also chaired a session on applications of satellite data to numerical weather prediction. This session includes two key presentations on 1) NOAA efforts on assimilation of current GOES radiances in Hurricane Weather Research and Forecast (HWRF) and the impacts on prediction of hurricane tracks and quantitative precipitation forecasts, and 2) the JMA demonstrations of positive impacts of assimilation of AHI motion vectors in its regional NWP on precipitation and typhoon forecasts. During the conference, Fuzhong Weng met with several JMA colleagues and discussed the future collaborations on assimilation of AHI data in NOAA and JMA numerical weather prediction systems. B. Kuligowski gave an invited presentation entitled "Demonstration of the GOES-R Rainfall Rate Algorithm on the Himawari-8 Advanced Himawari Imager (AHI)" at the First KMA International Meteorological Satellite Conference (KIMSC) in Seoul, South Korea which was held on November 16-18, 2015. The talk described ongoing pre-launch improvements to the GOES-R Rainfall Rate algorithm and showed some first results from applying it to the AHI in real time, which is the first real-time application of this algorithm on a sensor with capabilities nearly identical to GOES-R.
Members of the GOES-R Calibration Working Group (CWG) visited the vendor facility in Fort Wayne, Indiana on December 10-11, 2015 to support stray light testing of the GOES-R ABI. This test was conducted for the first time for ABI and is crucial for understanding the potential for stray light contamination on all flight models. The test was initially proposed by the CWG and our members attended the test at the vendor facility to improve our understanding of the test setup and conditions. The data will be independently analyzed by the CWG to expand our knowledge and understanding of the potential for stray light phenomena and develop capabilities for on-orbit anomaly resolution. 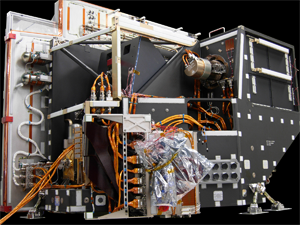 This work ensures the STAR GOES-R CWG team continues to provide technical oversight at the vendor locations during the pre- launch phase of instrument development to ensure data quality.